What's next for patient-centricity? How do we know when we are patient-centric? This webinar will delve into the challenges that pharma face when looking at their patient-centricity strategy, and the opportunities that exist with this approach. We will explore the key motivators for this approach, and steps to overcome the internal and external barriers, and most importantly – how do pharma companies know when they have become truly patient-centric? How should they measure the impact of their strategy through the lifecycle of a drug and their business as a whole? 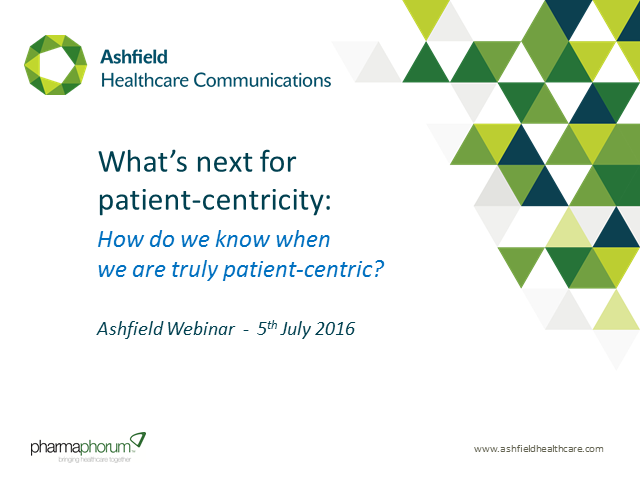 Title: What's next for patient-centricity? How do we know when we are patient-centric?